This is my final complete week at UKOLN. As I described in a post entitled “My Redundancy Letter Arrived Today” the cessation of Jisc’s core funding means that myself and the majority of my colleagues will be made redundant on 31 July. It occurred to me that it would be appropriate for me to publish a series of post which give my reflections on my time at UKOLN. I first arrived at UKOLN one hot July day in 1996 when I came for the interview for the post on UK Web Focus. I remember it was hot as I (foolishly) decided to walk up the hill to the University as it didn’t look too far on the map. If you’ve visited Bath University you’ll know that although it isn’t too far from the town centre, the university is located at the top of a steep hill. I would not recommend walking up the hill to a University on a hot day when you are wearing a suit! But the reason I came to Bath for an interview for the post of UK Web Focus was due to my role in setting up the first institutional Web service at the University of Leeds. As I described in a post entitled “It Was 20 Years Ago Today” the service was launched in January 1993 after a group of researchers organised a demonstration of various Internet technologies such as (I think) Gopher, Veronica, WAIS, Archie and the Viola WWW Hypermedia Browser. Although at the time there was growing interest in the higher education sector in use of Gopher to provide a Campus-Wide Information Service (CWIS) as soon as I saw the Viola application I felt that the future should be based on Web technologies. In retrospect that does not seem to be a particularly difficult conclusions to reach but it took another few years before the Web became accepted as the essential technology for delivering information services. At the time I was worried that Leeds University may have chosen the Betamax on Internet technologies – technical superior to its main rival but in danger of being marginalised by the simplicity of Gopher. During 1993 and 1994 I therefore gave a number of presentations across the sector highlighting the benefits of the Web and why it should be used rather than Gopher (or Guide or Microcosm, two British hypermedia systems which at the time had strong support in the universities of Kent and Southampton). Brian has given presentations about WWW at the universities of Aberdeen, Bangor, Bradford, Kent, Oxford, Sussex and Manchester Metropolitan University. He gave a poster presentation at the first WWW ’94 conference in Geneva and gave a paper on Becoming An Information Provider on the World-Wide Web at the INET 94 / JENC 5 conference in Prague in June 1994. He ran a WWW Tutorial at the Network Service Conference in London in November 1994. The seminar I gave at Oxford University left an impression. A few weeks after I gave the seminar I spoke to a librarian from Oxford University. After telling her about my recent trip there she responded “You’re the person who caused all the fuss!” It seems that my talk had been given shortly after a committee had decided that the University’s home-grown CWIS service was to be replaced by Gopher. My demonstration of the Web led to an influx of academics, researchers and support staff to the Oxford University Computer Services department the following day wanting a Web browser installed on their systems or, in the case of the more perceptive users, wanting to set up a departmental Web server. I understand that the policy decision did not last very long! 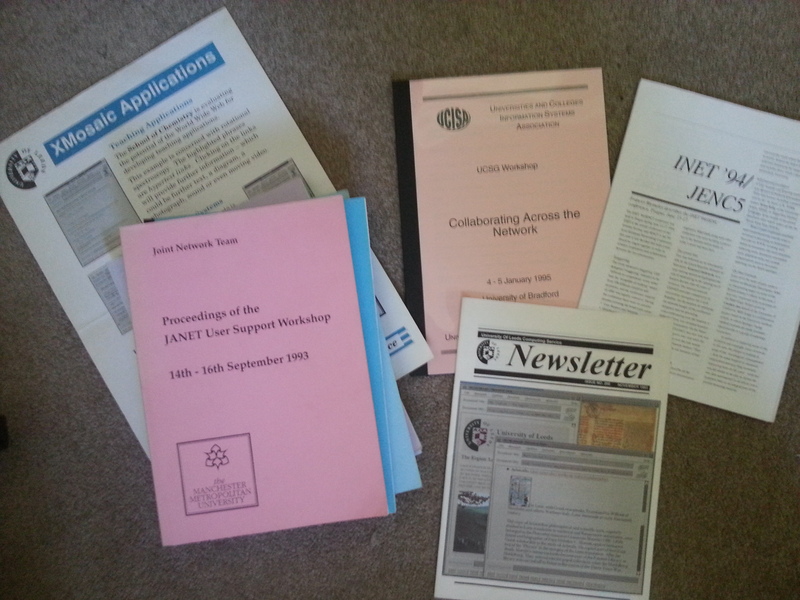 Looking at my personal archive from the early-to-mid 1990s it seems that I facilitated a workshop session on “Collaboration Across the World Wide Web” at a UCISA UCSG (Universities and Colleges Software Group) workshop held at the University of Bradford on 4-5 January 1995. The event was particularly notable as one of the keynote speakers was Lorcan Dempsey, the director of UKOLN who gave a talk on “Towards More Sustainable and Effective Resource Discovery“. This, I believe, was the first time I met Lorcan who subsequently put in a successful bid to JISC to host a UK Web Focus post, the post I took up in October 1996. Committees and similar decision-making bodies bodies can make wrong decisions! The technical strengths of technologies don’t necessarily mean the technology will become embedded – there is a need to pro-actively engage with early adopters and those who may be willing to become early mainstream adopters. The importance of having a high public profile. Working with national bodies can be an effective way of enhancing the take-up of innovative technologies. Keeping an archive of one’s professional activities can help in understanding the past and seeing its relevance. In tomorrow’s post I will describe how these approaches were applied during my time at UKOLN. The first time I remember meeting you must have been one of the last sessions you ever ran at Leeds before you went to UKOLN. I’d arrived at York that June fresh from my Publishing masters at Stirling to start as Web Coordinator (80% FTE) and came over to Leeds for a day seminar on webstuff. By then you’d already decided to go on to greater and better things!